SmartSDR 2.1 is the next incremental update, and is mostly designed with new hardware in mind. That said, I don't have one of the new radios, but I do have my 6700, and for us with the previous generation of radios, we have inherited the new features that are non-hardware dependent. This includes visual enhancements like shaded panadapters and tuning guides. It also includes some bug fixes and performance enhancements under the hood. DISCLAIMER: I am an alpha tester for Flex. However, it is important to note that while I test pre-release software, I am not compensated by them in any way, shape or form. All hardware and software is purchased by me. The first thing one will notice is that the logo has changed. Whoa, what happened? I was told that there was a bit of a branding change, but there really hasn't been any big fanfare behind it. Not sure why, but the new logo seems a bit nicer looking. Some love, some hate, but it's what we got now, and I like it. So, it's a marketing thing really. As you may have seen from photos and blogs by others, the PowerGenius XL also carries the same logo. Another thing you'll notice is that the panadapters are now shaded, or can be shaded. I mention this like this is a small thing, but in reality it has been a much requested feature by users. I don't necessarily get why but it does look nice. You can actually turn off or adjust this shading from the left side "Display" button, if it's not your cup of tea. Otherwise, at first glance the SmartSDR UI mostly looks the same. Well, except for the metering which has gotten a user-suggested makeover, and is now much easier to read. Oh, and the button that used to say "Remote" is now called "PC Audio" but it does the same thing - i.e. routes the audio through your computer, rather than the front of the radio. With this, Flex has fixed a longstanding item that I considered a bug. Previously if the audio happened to route through a DAX device, it would result in a crash. Now, it simply disables the capability unless you have a valid sound card device. I have tested this with regular headphones, HDMI audio and bluetooth headphones and speakers. It works really well through all of them. There is also a panel for the upcoming PowerGenius XL, but as that is still not fully released yet, that will be in a future post detailing operation of the amplifier. Suffice to say this will make operation of your amplifier pretty seamless - as if you were using a 2kw transceiver. "Into a dummy load of course" because I only operate legally, which means up to 1.5 kW on air. The biggest update of them all though is the tune guide feature. Yes! Tune guides! This can allow you to see the frequency as you hover over the panadapter and optionally enable single click tune (via the settings menu). Hover over and see where you will land! A word about MAC addresses: The OUI in your radio was previously a Texas Instruments OUI. With the new software release this will update to an OUI provided by Flex. This was done as a result of kernel changes and other software changes. If you set your radio to a static address via your router's DHCP reservation or similar feature, this will have to be updated in your router to keep the reservation intact. You can also use the mouse wheel to hover over and adjust by rolling/scrolling. Maestro also shares many of the same enhancements and UI changes. The interface should also be similar on the 6600M and 6400M, which are now shipping. Incidentally there are two Maestro hardware revisions now, since the tablet module in the original Maestro has gone out of production. The new revision of Maestro is functionally identical to the previous revision and visually identical except that the power button is now on the left side, instead of the top. Maestro does gain one very important feature - TNFs are now available! Just hold down your finger on any part of the panadapter to drop a TNF there. Marcus, DL8MRE has also been hard at work on getting SmartSDR for iOS also polished up and updated. I have been fortunate enough to help him with testing it. He has added the shaded panadapters and support for the PowerGenius XL. He has even added color shading that is not found in the desktop version. Some other features found in SmartSDR for Windows may or may not be added. As far as my impressions go - I will say that this release is pretty good, but is not going to be a huge feature update. 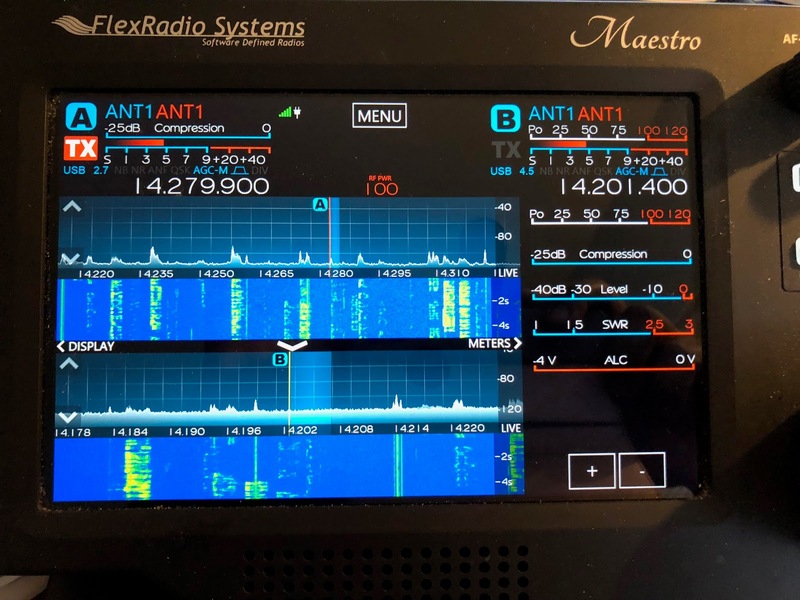 Considering that Flex has been working on four new radios, plus the amplifier, and a new partnership with 4O3A signature, I think they have done pretty well. There will be more to come as they continue to update and evolve Version 2. As far as the new radios go, I am on the fence, as I am very happy with my 6700. However if I plan to set up a remote site, I may consider a 6400 or 6600 for it. It comes down to money and willingness to take the risk. The new radios do bring some better filtering, an extra transverter port and modular design, along with a lower price. However, they take away the 2 meter capability and are limited to four (4) slices. I am one of those weird people that opens up 6-8 slices on a regular basis. So we will have to see. 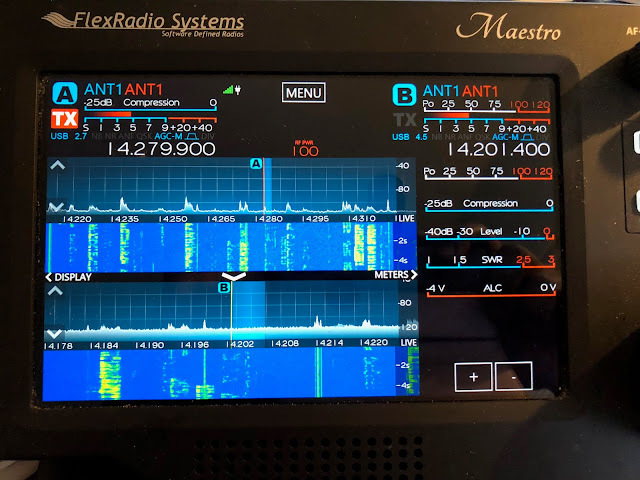 Mega kudos to the FlexRadio team on this release! Every one of them has been hard at work trying to get the new hardware and software out. Kudos to the alpha team as well who has helped tremendously with finding bugs and supplying performance and other data to the development team. Very Nice update Ria. Glad to see a few GUI improvements. Now that the big hardware push is done I hope we see some more of the requested features coming out. I know roadmaps are a thing of the past but if I knew that more GUI improvements were coming in 2.x I’d go ahead and get the 2.x release now. Not sure there is enough there for me yet. Multi client is so far the only thing that has been publicly advertised, since the M series would follow that natural progression. Steve has mentioned adaptive predistortion and it makes sense since the PowerGenius XL comes with the sample port. For Apple MacOS (OSX) you can download Don Agro's DogParkSDR. It is a third party client. Don is the same guy who wrote MacLoggerDX. There is also xDAX and xCAT which can bring DAX and CAT capabilities to Mac. For iOS as I mentioned, you can get SmartSDR from the App Store. It works on iPhone, iPod touch and iPad. You can also run SmartSDR in Parallels or boot camp, as I do sometimes. Nice write up. I may have to switch to an Iphone so I can take advantage of using my 6700 and PGXL. Hi Ria - Can you please post a photo of the PG-XL monitor window?